I’m not sure what I was expecting when I received a copy of this book, but it certainly wasn’t what I got. It was better. This novel is unlike anything I have read before. It is uniquely captivating. It is so well written that from the very first sentence I was Hester’s head, seeing and experiencing things through her eyes, rather from the eyes of the omniscient narrator. It is difficult to accurately describe Hester, not because Laguna has forgotten to include such details, but because Hester does not notice physicalities. It initially seems that Hester was born with disabilities that mean she sees the world in a way entirely unlike the average adult (whatever average may mean). But as the novel continues is becomes apparent that Hester is the product of a deranged mother and an abusive father, whom she calls Boot and Sack, and a society that continually fails her. Perhaps the best way to depict the genius of Laguna’s prose is to provide you with an extract. I’ve chosen the very first paragraph so as not to reveal too much of the plot. I slept at the feet of Boot and Sack. My one small bed went longways across the end of their big one. If I turned my head in the night and the moon was shining through, I could see the hill of Boot’s feet beside my face. Sack’s feet I couldn’t see but I knew they were there – no shoes, tipper-over and sleeping. Yet despite the simplicities and abnormalities of Hester’s mind, Laguna manages to incorporate prose that subtly informs us that Hester is not as stupid as her parents believe, and is capable of feeling far more than they will ever realise. In addition Laguna cleverly reveals the reasons behind Hester’s differences. Yellow wool wrapped itself around Cat’s black paws; she rolled onto her back, wool curled around her tum. It went round and around until Cat was in a yellow tangle. Every way she moved she tangled more. Cat was playing like the children at Christ’s feet when he made a visit to the marketplace in The Abridged Picture Bible. As the plot thickens Hester is seemingly offered an escape in the form of school during which time, despite the cruelty of many of her classmates, she manages to nurture a friendship. Unfortunately for Hester her luck does not last, and soon her life takes a much more sinister path. Not only does Laguna successful portray the thoughts and feelings of a young girl to whom society all too often turns a blind eye, she highlights inadequacies in society’s treatment of those with disabilities. This is a book that whilst revealing horrors, also finds sublime innocence. It is a unique, fascinating read. One Foot Wrong has been nominated for the Miles Franklin Literary Award and the Prime Minister's Literary Award for Fiction. 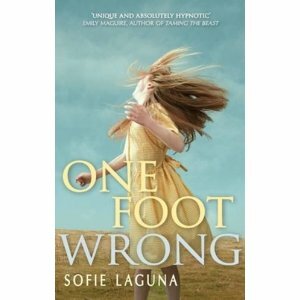 One Foot Wrong by Sofie Laguna, published by Allison & Busby is available now.